Looptate Games - Welcome to VHSum Games! Math is used in our daily life. Arithmetic operations: +, -, *, and / are the cornerstones of math. Normally, we learn addition first, before the other operations. VHSum reverses the thinking of addition. For example, given the number 26, we would like to determine which numbers in a given group could add up to 26. This is an example of simple logic analysis. 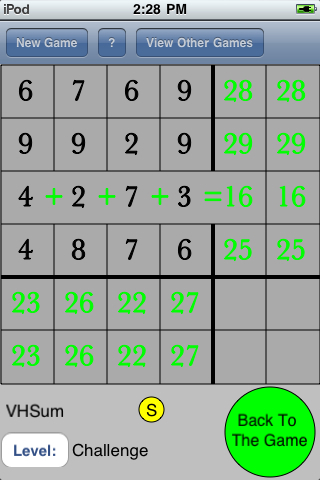 This game uses the digits from 2 to 9 and has four levels. Beginner level: contains four equations each involving the sum of two numbers. Intermediate level: contains six equations each involving the sum of three numbers. Advanced level: contains eight equations each involving the sum of four numbers. Challenge level: same as the Advanced level with four extra input numbers which can be used. To play, the player swaps the numbers that are used in the equations. The player continues to swap numbers until all equations sum up to their target sums. Figure 1, it shows the equation for row 1 when the player touches the cell of 10. Figure 2, it shows the equation for column 1 when the player touches the cell of 19. The player needs to pick up the first number to swap. The selected number is highlighted. In Figure 3, the player picks up the number 7 in row 3 and column 4. 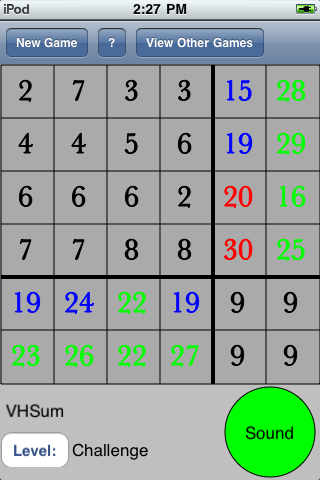 The player picks the 2 in row 1 and column 2 to swap with 7. Figure 4 shows the results after 7 and 2 are swapped. In column 5, you could see 10 and 25 are updated to 15 and 20. In row 5, the second 19 and 24 are updated to 24 and 19 respectively. Column 5 and row 5 show the sums of the additions. Column 6 and row 6 show the targets of the additions. Let’s have a look into row 3 in Firgure 4. The sum of these four numbers is 20 but the target is 16. We need to remove 4 from these four numbers. We decide to swap the second 6 with the 2 in row 1. Figure 5 shows the result after the swap. 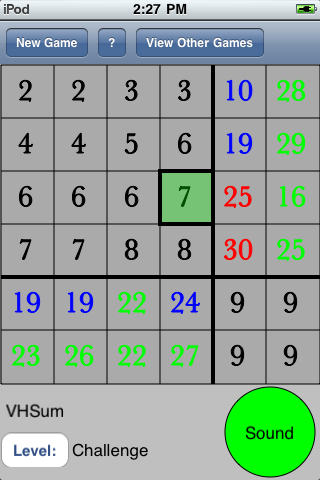 The result 16 is the same as the target and its color is green. If the result is larger than the target, it is red. If the result is smaller than the target, it is blue. The help (?) button will show the player the possible actions he can take. Touching the ? button will also reveal the SOLUTION button. The player can press the SOLUTION button to see the solution. Copyright 2009 Looptate Games. All rights reserved. Apple, iPod, and iPhone are trademarks of Apple, Inc.